Taken place on November 11, 2010. 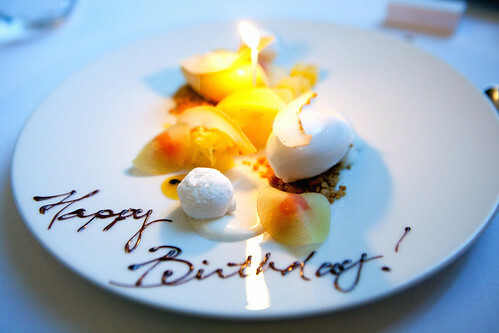 A good friend of mine took me out to Eleven Madison Park for my birthday. It’s been two years since I’ve last went to Danny Meyer’s crown jewel of his restaurant empire. Back then, I enjoyed every moment there from the second I stepped through their revolving doors to the moment I bid farewell to the staff as I left. Every morsel of food that passed my lips were savored and admired for its perfection. 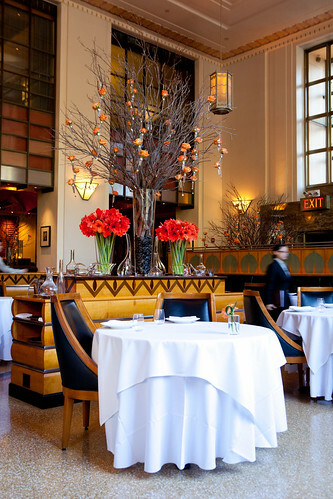 There was a lot of commotion around the NYC dining scene about the renovations that took place around the Labor Day week, especially the overhaul of the menu. Diners who were loyalists to the pre-renovated EMP wondered would it still be good, even if the Gourmand tasting menu is no longer served? Reading a lot of opinions/reviews (on Chowhound) and articles that were published after the renovations, overall everyone praised it’s as good or even better than its former service. 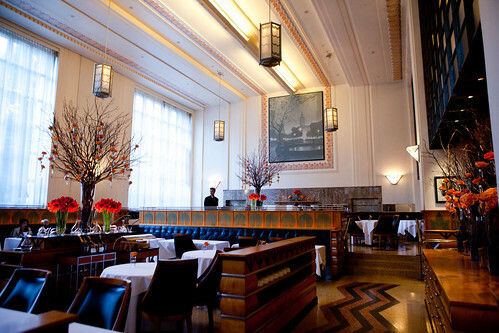 That my friends, makes me psyched for my lunch at EMP even more as one of my good friends took me out here for lunch. Entering though the same revolving doors, we were greeted by a hostess. My friend mentioned my name, as it’s reserved under it, and the hostess welcomed my friend and I back and bid me a happy birthday. 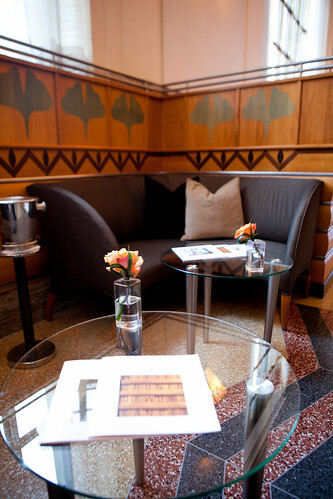 (To those who are into the minute details, the host podium is right next to the door, close to the stairs that lead to the bar.) Since we were early for our reservation, we sat at the lounge and waited there and observe the changes that took place in the dining room. Nothing drastic was done to the room. It is still beautiful and stately here with the soaring ceilings. As we’ve been told later on our tour (I’ll get to that much later), the restaurant got rid of the back tables near the kitchen that used to sit larger parties (losing 34 seats) and replacing it with a pantry. 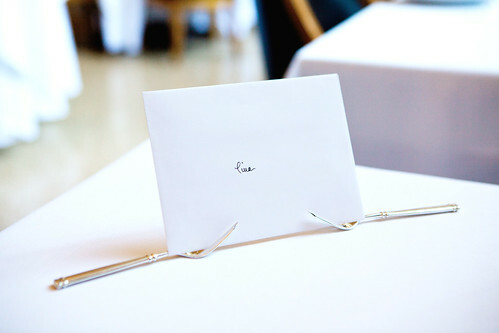 When we were escorted to our table, a card was set along with our flatware and glassware. 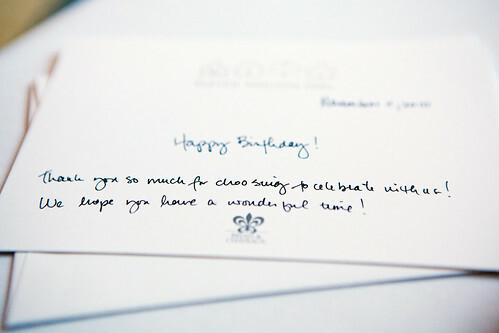 I’m very pleased that they written a birthday correspondence for me. Our waiter then introduced us and gave us what everyone was talking about, the new menu. 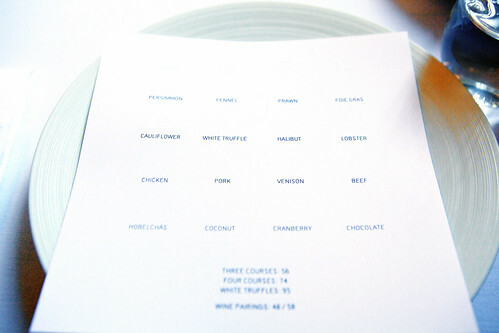 It is a grid like everyone published and it states the main ingredients for each course. Going from the top row (going across), these are first courses served cold, the row just adjacent to it are warm first courses, proceeding down progresses on the meal. Three courses are $56, four courses are $74, white truffles are $95 and wine pairings are supplement, as of the time I went. I chose foie gras (and accidentally persimmon, I’ll explain) and lobster, while the remaining two courses are the kitchen’s choice (but no chicken or chocolate). My friend chose foie gras, halibut, pork, and chocolate. I learned that you’re not supposed to mix with the ingredients on the menu grid, though I wanted to have the combination of persimmon and foie gras, as my waiter noted my request. I emphasized I like bold flavors and I don’t mind having adventurous food. After our orders were taken, the first set of amuses came out: gougeres, black truffle butter and chive toasts, and chicken velouté. The gougeres were as dreamy as can be. 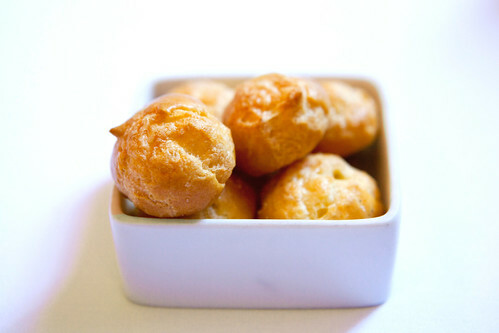 Warm, crackly exterior with an airy, cheesy, salty puff. 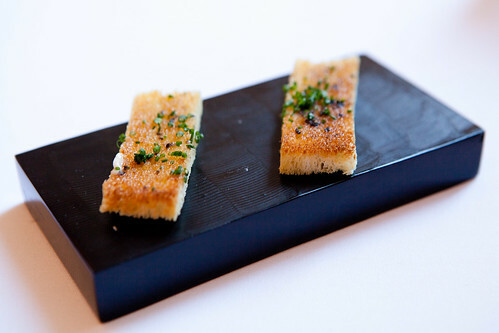 The toasts were crisp and musky with truffles and the onion-y chives gave it a bracing flavor to give it a zing. 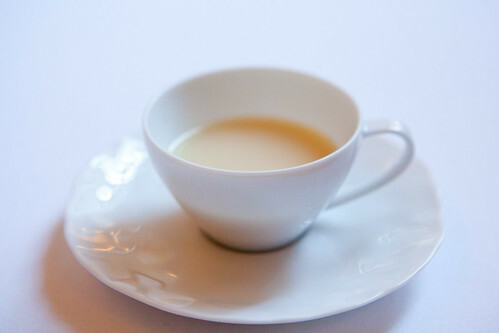 The velouté is something you’d wish your grandmother, mother or your significant other would make when you’re having a bad day or a cold. It’s the richest, creamiest yet cleanest chicken soup I’ve ever drank. The tea cup size is a proper amount of this soup before it’ll be overkill. Moving on to the next set of amuses, we were presented with smoked sturgeon sabayon and chive oil and soft poached egg, smoked white Alba truffle and foam of white Alba truffle. 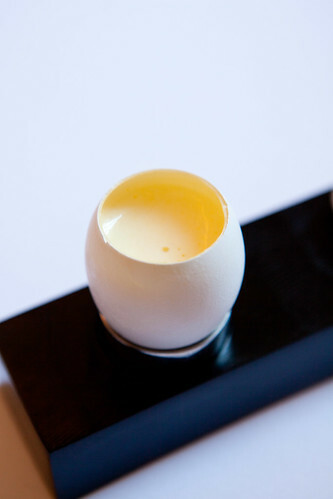 The smoked sturgeon sabayon was set into a chicken egg. 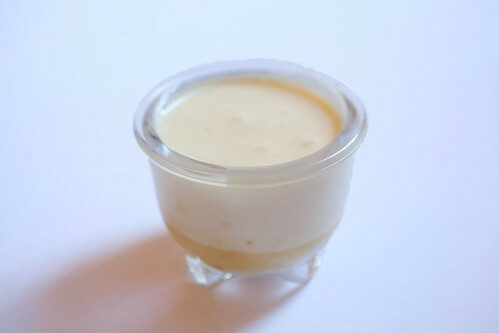 The warm, thick, creamy savory custard with a strong undertone of crème fraiche was heady with truffle scent and there were small bits of salty, smoked sturgeon that’s settled on the bottom, along with the vibrant chive oil. The soft poached egg was a larger portion than the previous amuse. 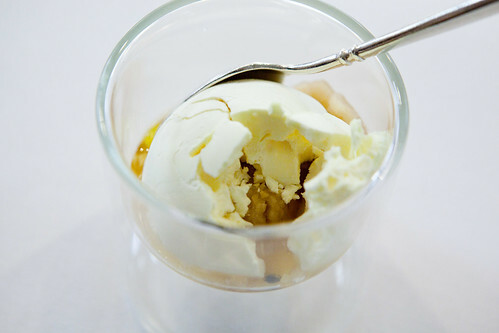 This savory custard has the hidden oozy poached egg yolk that’s hiding on the bottom of this cup. 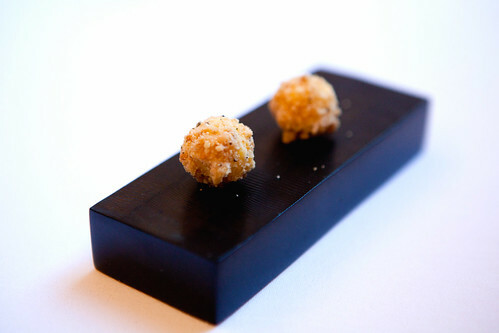 Every bite has the aromatic Alba truffle (even the foam was infused with white Alba). 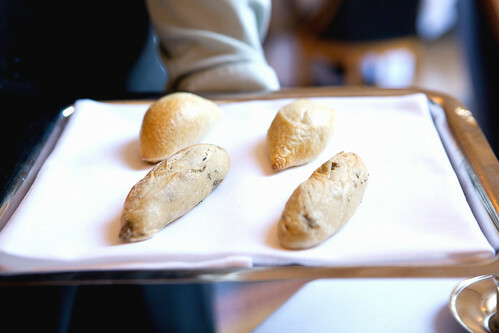 After all of the amuses were served, we had bread – rosemary picholine olive roll and a miniature baguette. Despite of it’s pallid appearance, the bread was served warm and tasted fine (though the baguette was a bit lackluster for being too dense). 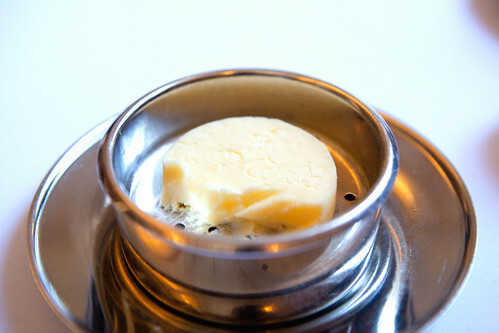 The goat’s milk butter was better than the cow’s milk. 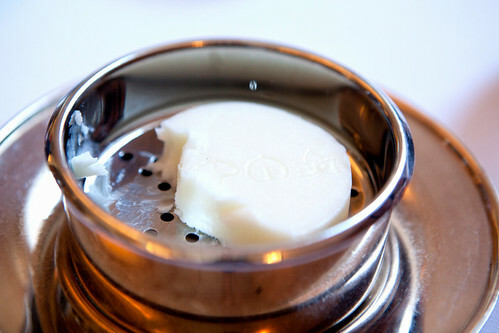 I enjoyed the mildly tart, floral flavor of the goat’s milk butter. As I’ve mentioned earlier, both of us ordered foie gras. 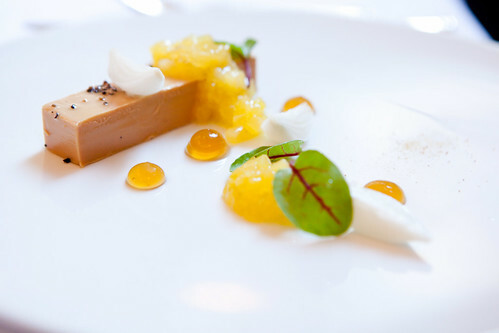 My preparation was what I (accidentally) requested – foie gras with pickled persimmon (pictured on the right). 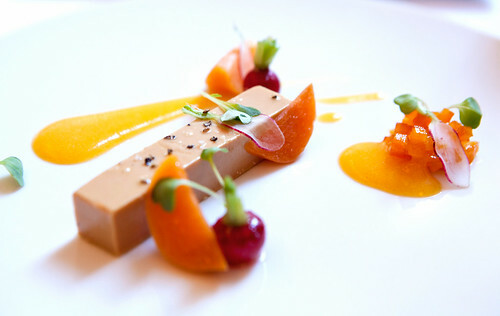 A slender torchon of creamy, decadent liver with sweet carrot purée, crunchy, baby breakfast radishes and candied orange zest, dancing between the fine line of sweet and savory. 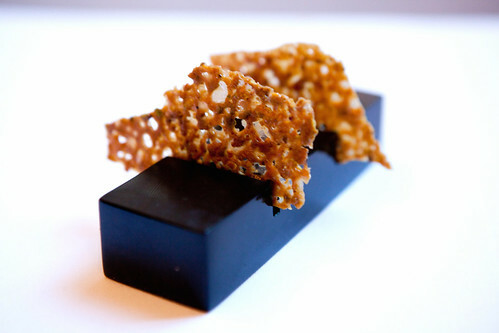 It was a unique foie gras dish. 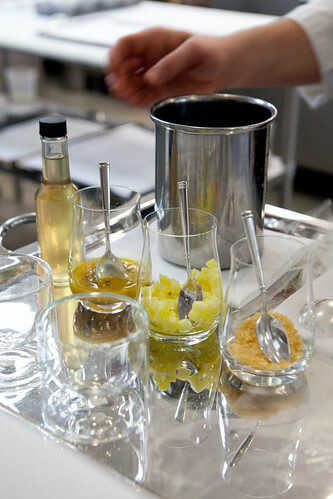 My friend has the pineapple and Sauternes gelée preparation. It’s the same one I had the last time I was here and it was still as good as I remembered it but not as thrilling as the one I had before me. We both had a plate of toasted round of brioche and foie gras brûlée served along with our foie gras torchon. (I suppose the kitchen was ensuring us that we should have enough foie gras?) 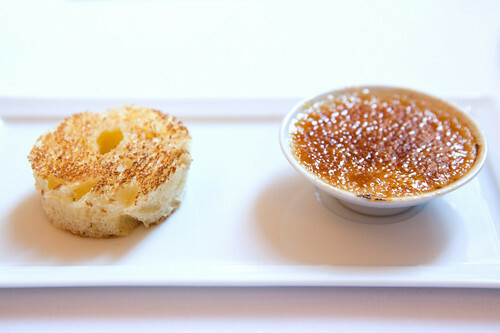 The brûlée would closest resemble to a warm, melted foie gras ice cream (or fresh made foie gras savory ice cream custard) with the glass-like surface of burnt sugar. Rich and very dreamy. My butter poached lobster was up next. Buttery and scented of chanterelles and amplified of it’s richness and fungal intensity, two large spoonfuls of matsutake sabayon were poured. Eating this dish this was bliss. Everything was silky and tender. 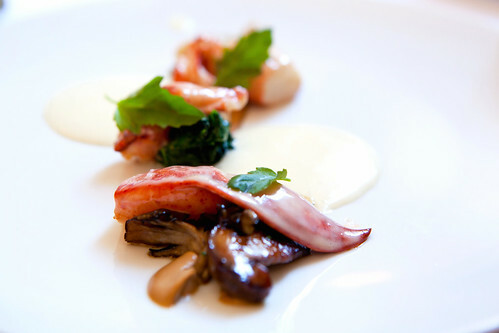 The flavors were intense and hits your palate with every flavor note it has from the sweet lobster and spinach to the earthiness of the chanterelles. My mind was blown away. 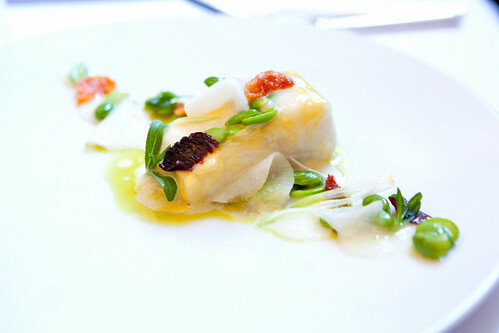 My friend had the olive oil poached halibut with edamame, daikon, and blood orange caramel. This was delicately flavored compared to my lobster dish. Instead of having fireworks exploding in your mouth (e.g. lobster), this was like having a candle lit. It’s more suited for people who like to have or want delicate flavors for seafood. It’s very well executed – the halibut was tender and cooked perfectly and the edamame were little crunchy bits to contrast the softness of the fish. The blood orange caramel gave it a little tweak of sweet and tangy. As the third course marched on, I started to feel full. The kitchen chose to serve me venison with pickled red cabbage, cabbage, pork liver, diced apple and potato purée. 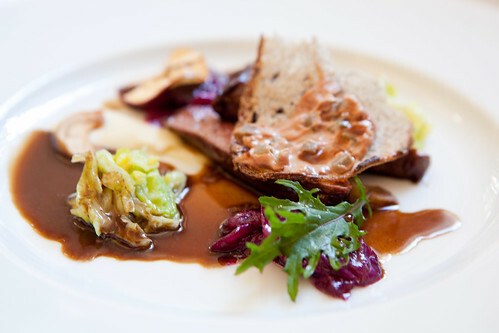 The venison was tender, juicy, and eaten along with the toast slathered in pork liver puree, makes it darker and richer. My friend’s pork was pretty much pork two ways. 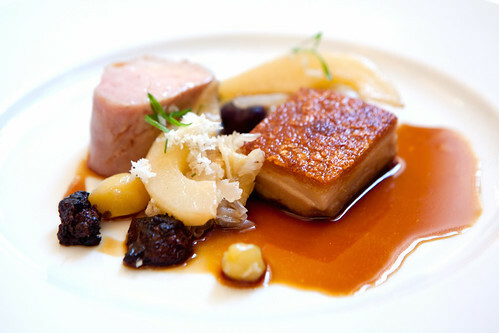 It’s a small brick of crispy pork belly with portion of pork loin with morcilla sausage, pear, pearl onions and vinegar. As expected, the pork belly was the beloved item on that dish. The accouterments added layers of flavors that plays along with sweet and cut through with tart. After clearing the dishes, the same hostess who greeted us walked up to our tables and asked us to take a tour of the kitchen. Delighted to move since we’re both very full, we agreed. Walking toward the back where it used to have round tables that seated parties larger than four, and several two-tops, it’s now a waiter’s pantry or buffer zone between the dining room and the kitchen. All flatware, glassware, waters (tap, hot, and bottled), and even the (infamous) coffee cart resides here. The photos that lined the walls are from the EMP staff who have a photography hobby. Just steps away was the entrance to the kitchen. Gleaming in bright lights, first thing one can see is the large list of adjectives written in the New York Observer back in 2006, relating EMP to Miles Davis. 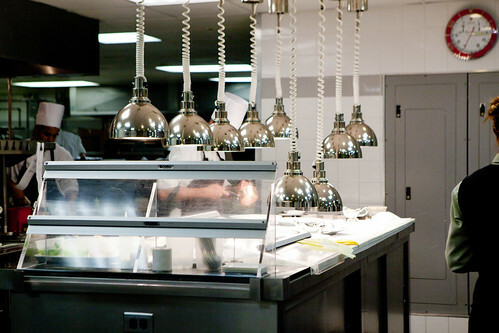 Moving slightly into the kitchen, there’s many stations around, cooks prepping, stirring, and plating dishes. Most interesting area was where the heat lamps were since many plates were composed several feet away from you. Even a cook would stop cooking, walk up and say “Hi” to you when he’s done with his cooking for the minute. Then we moved a few feet to a station, so to speak, along the wall where a large black and white portrait of Mr. Davis hung with a table for my friend and I to stand in front of and a space were one of the assisting pastry chefs created our frozen pineapple and passion fruit daiquiri. It felt like watching a science project done in real time. 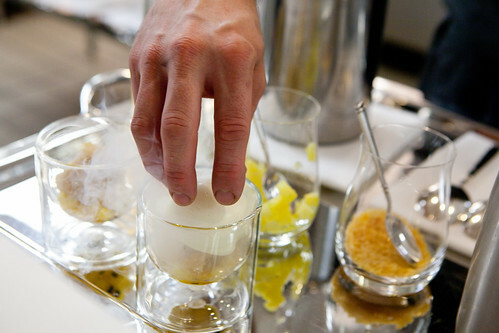 Seeing liquids and custards “boiling” in a large pot of liquid nitrogen all done meticulously yet gracefully, I was amused. When the chef was done and presented the frozen daiquiris to us, we thanked him and he go back to his previous duties. We stood there observing attentively, while eating slowly through the solid cocktail. The daiquiri was sweet from the rum and fresh pineapple used and the passion fruit mousse (the frozen hemisphere) was refreshingly tart and added a crunchy texture. After lingering in the kitchen for five minutes or so, we were escorted back to our table. Soon enough, we’re graced with dessert. The kitchen chose coconut and inscribed “Happy Birthday” for me. It’s coconut vacherin, coconut yogurt, papaya, coconut sorbet, mango, pineapple and passion fruit sorbet. 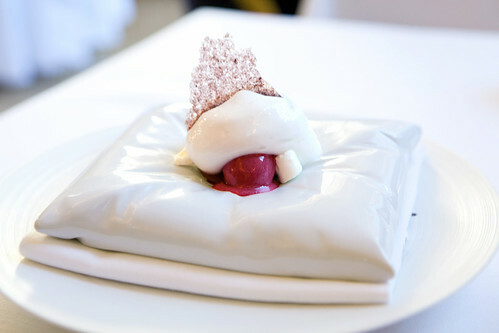 This dessert could transport you to a tropical island. 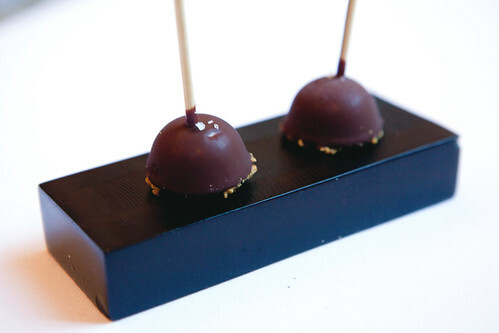 My friend’s chocolate was the same chocolate dessert I had at StarChef’s Gala a few months ago. 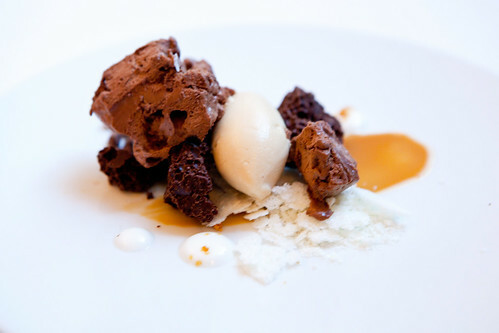 Simply remarkable in textures and range that chocolate can have in a dessert. From bitter dark chocolate to sweet milk chocolate, bites that were smooth and silky to cold and crunchy. My friend was swooning. At this point when petit fours of roasted banana pops, pistachio tuiles, and white truffle with a scent of truffle, we were both full. Both of us were struggling to eat these bites but I plowed on and ate every one of them. The banana pops plays on nostalgia – frozen, crisp chocolate shell meets an unexpected liquid core of banana. The pistachio tuiles were straightforward. The white truffle was sweet from the white chocolate but has the unexpected truffle (the fungus) flavor. After spending nearly four hours(!) for this four course meal, this was definitely a luxurious birthday lunch. And counts as dinner for me. After asking for the check, my friend and I trudged our way out the door, talking between us how everything was delicious yet having a really full stomach. For more photos of this lunch, please view the slideshow below. 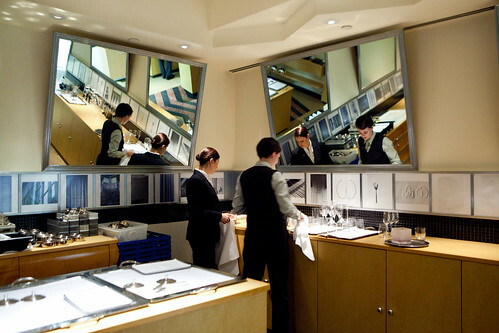 Reservations are recommended to be made 30 days in advance. But yes, every minute detail was paid attention to. If you ever have the opportunity to eat here (celebrating or other wise), I totally suggest it. Nice to see that their lunch is as polished as their dinners. Teddy: Thank you. I think it’s worth eating. 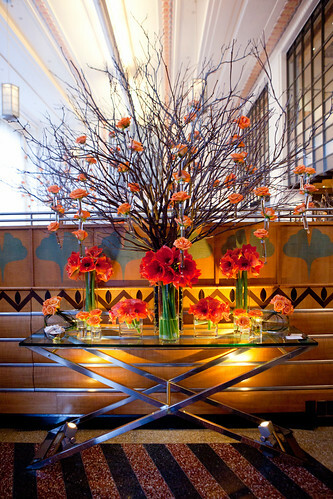 Hungry: EMP always been polished ever since Chef Humm was their executive chef. wow, it kind of sounds like they went from having a steal for lunch to really elevating it to a four star experience. i wonder if everyone can get a kitchen tour if they asked. It’s definitely a four-star experience for both lunch and dinner. I think any diner can request a kitchen tour. I remembered it’s a fairly common practice for dinner service when I read through Chowhound.